Recovering from the SAM fault proved more challenging than expected, so our planned drive to the patch of pale tan bedrock in the image above did not take place. We took advantage of the fact that we have been parked at this same site for several sols to acquire both new and less-common types of observations. ChemCam's RMI peppered Mt. Sharp with long distance mosaics, imaging a dramatically-layered unit pasted on the flank of Mt. Sharp above us, and various steep slopes to look for evidence of grain motion downhill. In a departure from the normal mid- or late-day imaging blocks available to MAHLI, we planned an early morning arm backbone to get dawn's early light on the target "Arnaboll." Before MAHLI images Arnaboll, ChemCam will shoot it with a raster to clear off dust and measure chemistry, and APXS will perform a long overnight integration to add to our chemistry data from this site. Mastcam will acquire a mosaic of "Soay," a small, unusual depression about 8 m ahead of the rover, and a multispectral observation of two targets previously shot by ChemCam, "Cocksburnpath" and "Harra Ebb." 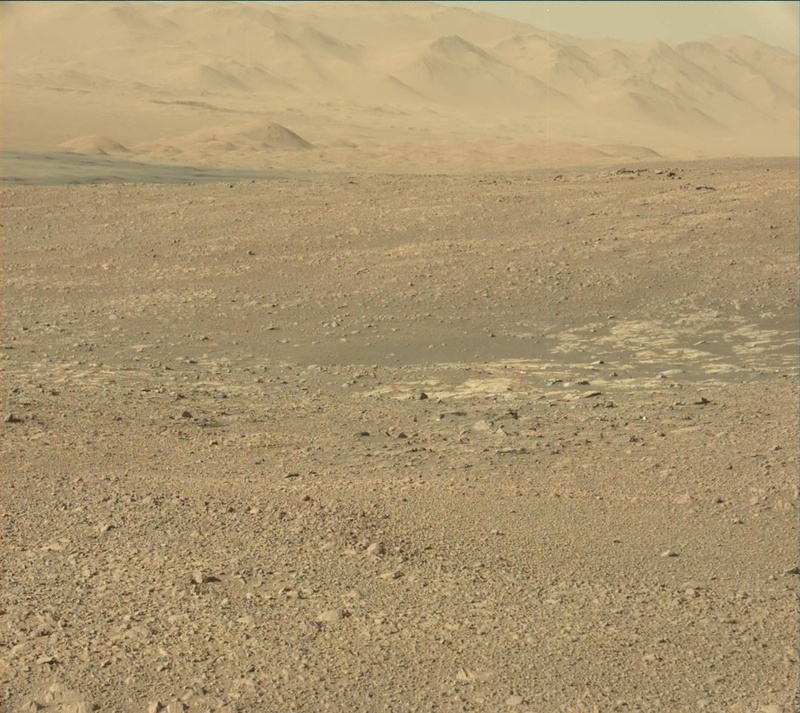 Both these targets have a purplish red color, and the goal is for the Mastcam spectral data to illuminate how (or if!) iron-bearing minerals contribute to those colors. We were able to fit in multiple sets of environmental observations across both sols, with early morning and afternoon observations of dust in the atmosphere, and movies looking for clouds and dust devils. DAN passive will probe the subsurface around us for over seven hours, as well!